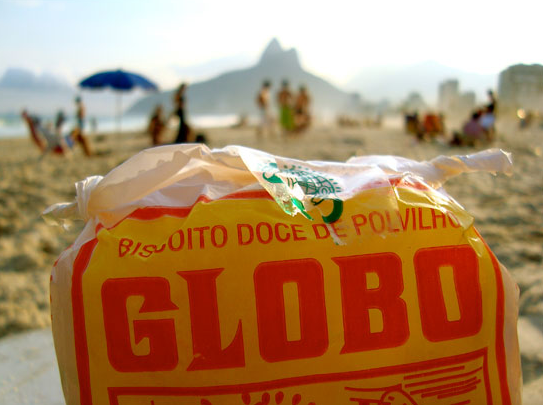 Ask any beach-going Brazilian that has been to Rio de Janeiro what images come to mind when they think of Rio and I’d bet Biscoito Globo is one of them. The famous doughnut-shaped powder biscuits are as common a sight as the sunbathers in Ipanema applauding the beautiful sunsets, silhouetted by Two Brothers hill. Speaking of brothers, three from São Paulo deserve some applause, too, as they are responsible for another pleasing sight, one that can be sweet, like catching some rays, or salty, like the sea itself. According to the Biscoito Globo site, it all started in 1953 when, after their parents separated, the three Ponce brothers went to live with their cousin who had a bakery in Ipiranga, in São Paulo. It was there that they learned to make powder biscuits with their cousin, which were sold on the streets of downtown São Paulo. In 1954, taking advantage of a large religious conference in Rio de Janeiro, the brothers decided to sell their biscuits in the carioca capital. With their recipe for success, the Ponce brothers foresaw that, given the biscuits characteristics, Rio de Janeiro would be the ideal market for what they were selling. The powder biscuit was given the name Globo in honor of the bakery contracted to make them in Botafogo. The year was 1955 and the biscuits were sold in the Globo bakery and in seven others, owned by the same people. Realizing the large demand for them, the Ponce brothers started to sell them to other bakery chains and in 1963, they formed a partnership with a Portuguese baker, an expert in breads. There are other positive aspects that accompany a bag of Biscoito Globo, such as the fact that it’s perfect for making one’s stomach believe it’s fuller than it is. After all, who wants to swim on a full stomach? Other associated benefits mean the customer receives something that is low in calories, low in fat, without neither coloring nor preservatives. Cultural fluency is part of our language-teaching approach. At Street Smart Brazil you become fluent in Portuguese and learn to navigate the Brazilian culture with ease. Don’t be an outsider. Book your Trial Lesson to see how we can make your life easier in Brazil. The other call is "biscoito grobo, doce ou salgado"